Today Ola Al-Qaradawi was transferred from Qanatir prison to the courthouse in the police academy within the Torah prison complex for her pretrial detention extension hearing. She was placed in the glass sound-proof cage awaiting her turn. The judge extended her detention for another 45 days without any opportunity for Ola’s lawyers to present arguments against the extension. However, for the first time the judge authorized access for Ola’s lawyer to speak with her outside of the glass cage and instructed authorities to grant this request. US embassy officers showed up at the courthouse but the judge denied them access to attend. Ola is on the brink of 365 days of solitary confinement in one of the worst prisons in Egypt, which both Amnesty and the UN have concluded amounts to torture according to international standards. She has been subjected to abuse and has been denied visits from family and lawyers since her arrest one year ago. 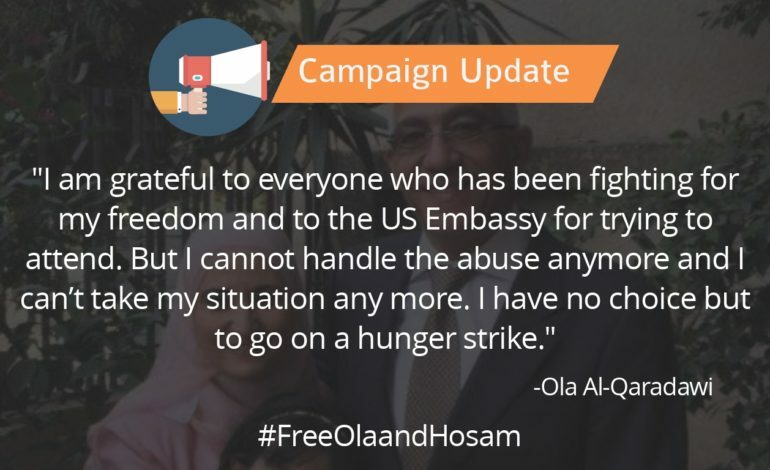 Ola informed her lawyer that she has started a hunger strike to demand her freedom. She is hoping to force prison authorities to improve her conditions and stop the torture. She is also demanding due process and her immediate release. Her lawyer discouraged the hunger strike because her health has already deteriorated significantly and her conditions are life threatening, but Ola said she will continue refusing food until her demands are met because she cannot handle the situation any more. “I am grateful to everyone who has been fighting for my freedom and to the US Embassy for trying to attend. But I cannot handle the abuse anymore and I can’t take my situation any more. I have no choice but to go on a hunger strike,” Ola explained to her lawyer. Ola asked her lawyer to inform her family, the United Nations, Amnesty, Human Rights Watch, and her US lawyer Jared Genser. Unfortunately the family will not know the implications of the hunger strike for another 45 days. Last week the United Nations Human Rights Council’s Working Group on Arbitrary Detention (WGAD) issued an opinion after 6 months of investigation and determined that Ola and Hosam’s detention was illegal and called for their immediate release. Today, June 26, is the United Nations International Day in Support of Victims of Torture which is held annually to speak out against the crime of torture and to honor and support victims and survivors throughout the world. Today the family calls on all supporters to lend their voice to Ola who has been silenced for almost a year while she has been abused and tortured.